63rd-77th STEPS or Art Project Staircase is a project space run by Fabio Santacroce. The staircase is located in the building in Bari where Fabio currently lives. The project title refers to the area between the 63rd and the 77th steps. It includes three walls, three small floors, a wrought-iron handrail, a door, a wood roof, a window and the last 14 steps before access to the building terrace. 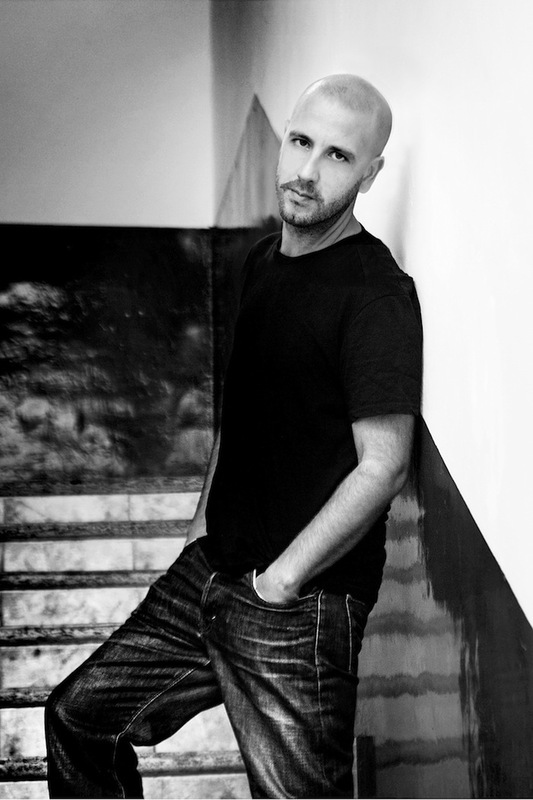 Here, Fabio hosts site specific exhibitions while also curating off site and online projects. Ada O’Higgins: Can you tell me a little about Il Futuro Era Bellissimo Per Noi featuring Mariantonietta Bagliato, Mathis Collins, Cédric Fargues, Anna Franceschini, Frieder Haller, Kareem Lotfy, Emanuele Marcuccio, Quintessa Matranga, Josip Novosel, Fabio Santacroce, Ilya Smirnov, Anna Solal and Sean Townley? Fabio Santacroce: Named after the verse of a pop Italian song, “Il Futuro Era Bellissimo Per Noi” is the first offsite exhibition outside the city confines. I was invited by Anna Solal to organize a show in her studio at Cité Internationale Des Arts in Paris. The English translation is “the future was beautiful for us”, which evokes a temporal conflict and a bitter mood that the artists involved translated into these intense artworks. AO How does it differ and continue your exploration of the Bari staircase? FS The exhibition has a more dark spirit than that of 63rd-77th STEPS, but it amplifies the collaborational attitude which is at the basis of the entire program. Accidentally the space contains a beautiful staircase, which creates a strong connection with the original location. AO Where does the staircase lead and where does it begin? Does the staircase bring you up or down? FSI like the existential and humorous undertones in your question. I will start by answering the second question because it mentions the polarities that I’m fond of, their ingrained codependency and the hierarchical structure where I think the most crucial choices and responsibilities are experienced. 63rd-77th STEPS inevitably brings me up and down, just like any activity that I have lived so far in my life. I enjoy this reckless oscillation and the tension that ensues. 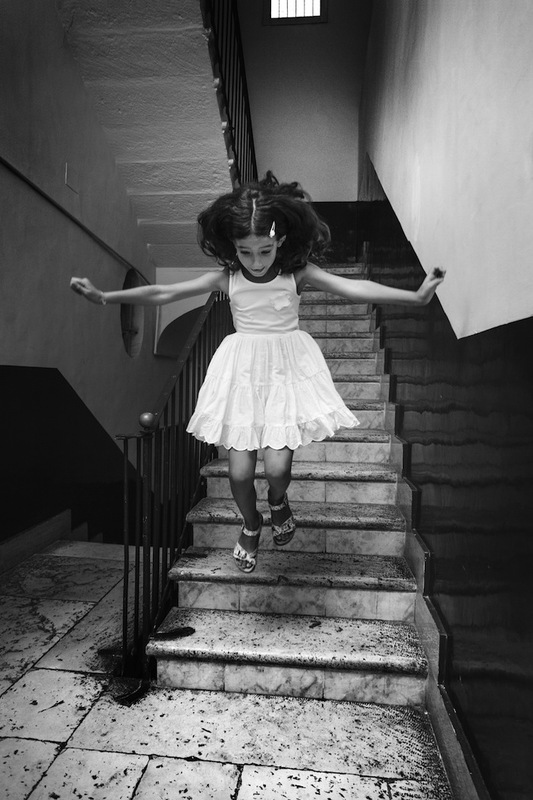 It reminds me of when as a child, and used to play with my neighbour’s friends on our communal staircase, running upstairs and jumping from the top in one breath. My staircase definitely begins at the bottom, which I regard as the top. It is not finished yet and aims high to incisiveness and creative thinking. AO Could the staircase symbolize the volatility of the art market? 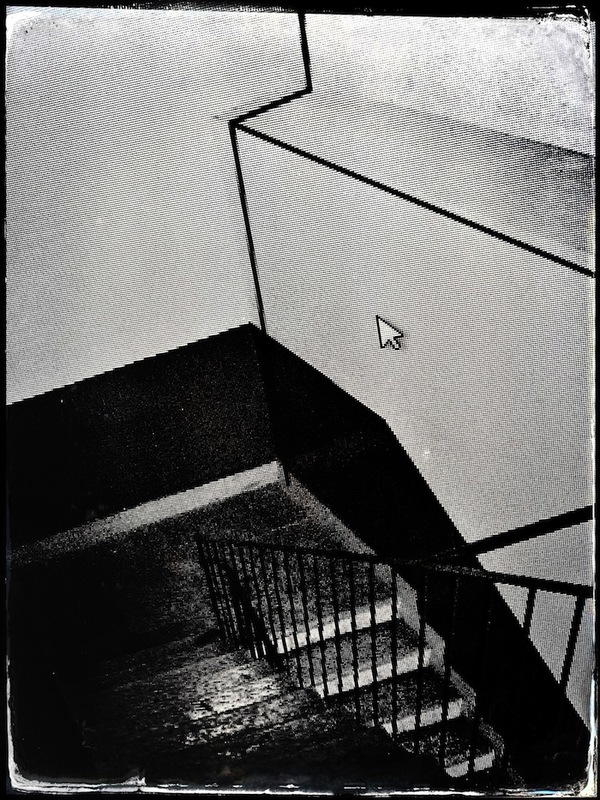 FS I see the staircase more as a symbol for something visceral that represents a certain suspicion and disenchantment towards the comedy of Art, and an inability to participate in it with carefree enthusiasm. I wanted to create something reactionary, in my town, something that could express the “sulphurous” charge of the South, where I come from. I see it also both an aestheticization and a subversion of a certain Southern Italian working class sentimentality and vulnerability. AO How does exhibiting in this space affect one’s conception of the domestic/public divide? FS I like how the staircase resides in the nexus between two spheres to which I’m devoted: the domestic and urban space. I find it a unique example of the separation of public and private domains, whose boundaries are blurred and constantly redefined. It is part of a private environment shared by its inhabitants, but it’s use is actually characterized by other public “incursions” to which all the private subjects agree. This makes me think about the management of our profiles on social networks and to Danah Boyd’s analysis in the essay “Social Media is Here to Stay… Now What?“. By identifying and describing three types of space (public, private and controlled), she often refers to the adolescents’ virtual space within their own domestic environment where private and public domains coexist. The teens, she says, try to define their own private space in the interstices of controlled spaces such as bedrooms with closed doors, where they can activate their public selves through social networks, while physically remaining in a controlled domestic space. 63rd-77th STEPSbrings together all these definitions and possibilities. 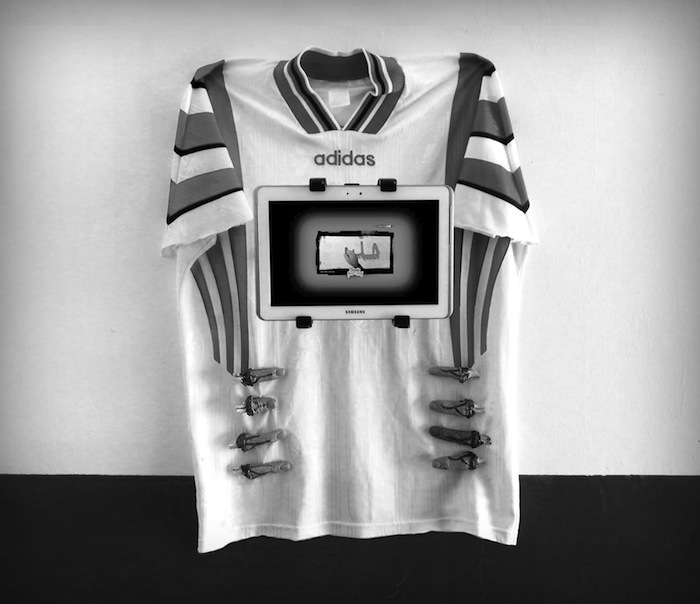 AO What is the point of exhibiting physical work of Net artists? By choosing the overlooked space of the staircase, you are highlighting IRL as opposed to internet spaces as valuable modes of exhibition, yet the gallery lives mostly in the images it creates that are circulated. FS The program exists in many different formats: site-specific exhibitions, physically installed on the staircase, are alternated with on-line and off-site projects, meant as an extension of the physical and symbolic space. 63rd-77th STEPS doesn’t decree any one spatial supremacy, rather it runs seamlessly, commuting and dissolving the boundaries between real and virtual. The physical exhibitions are accessible either live and online and this enables a constant “switch” between IRL and URL, as well as a frequent linkage to the city of Bari and its sub-cultural texture. “Net artists” have not been the only ones involved, they have been shown alongside artists for whom the staircase has been the first digital exhibition experience. For the online section foreign artists are invited to explore the space long distance, without any physical involvement. With the off-site activity, 63rd – 77th STEPS overtakes topical and institutional spaces around the city, setting up pop up events. I find this articulation and its parallel fruition essential to expanding, visually and critically, the physical marginality of 63rd-77th STEPS and its infelicitous vein. AO The catalyst for our current recession was a real estate crisis. Was questioning or reinventing the real estate where is art is shown an important goal for you, or was it more about using whatever space you had at hand, or challenging the artists, or…? FS 63rd-77th STEPS doesn’t address the real estate crisis specifically, but rather a general attitude of resilience and idiosyncrasy, that acts as a subtext to the whole project. AO Who owns the space, is there an ownership issue involved? It seems like the staircase eschews market value, but do the works? Are they for sale? FS The 63rd-77th STEPS are the last segment of a communal staircase, synchronized with the everyday life and genuineness of a building inhabited by a few families. This residual space that leads to the terrace has always been used as a sort of deposit, a dustbin of old objects and waste materials, and it was steadily becoming a mess. When I expressed to my neighbours the wish to convert it into a temporary exhibition space, they embraced my idea enthusiastically. I took over the restoration and redecoration of the space and this initiative inspired the other tenants to pay more attention to the shared spaces inside the building. Works have never been sold because, besides the legal impossibility, I never felt the need and the desire to establish a commercial discourse. I’m not very interested in flirting with buyers. The only show that has so far contemplated selling work, in order to support the exhibition programme, was AFA2, held on the beach of Pane e Pomodoro. 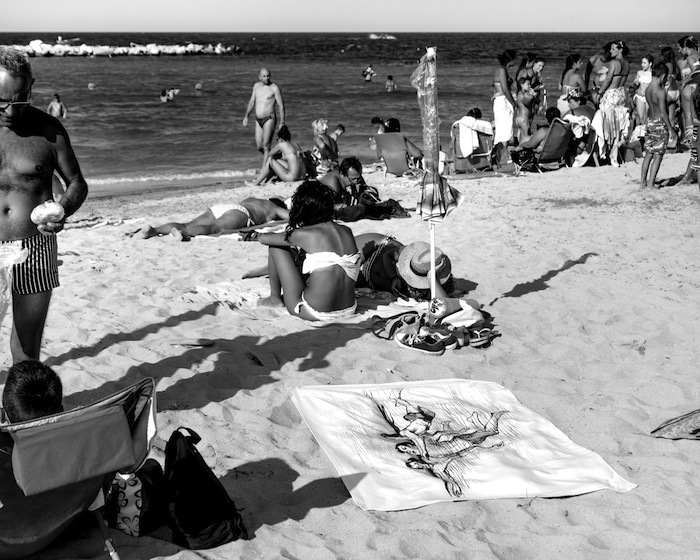 For the occasion, 13 artists designed B&W microfiber beach towels, installed over the sand among bathers and beach supplies. AO The staircase is a neutral space that doesn’t have value on its own and takes you form one important place to another. By giving this space importance you remind me of David Joselit saying that “One of the important things I take away from this is that we need to change our habit of thinking that art objects stand for something else; that their primary function is to represent. Instead, these objects act in various ways, including provoking future events or effects. Representing is always retrospective: something has to pre-exist the art object in order to be re-presented. I think art’s special capacity is, on the contrary, its futurity.” i.e an art object it is not simply a bridge/staircase from a concept to a physical reality, but also an object that can create new meaning. What are your thoughts? FS I’m very interested in the idea of futurity quoted in your question. I totally agree with it and I find it very suitable to the 63rd-77th STEPS project, whose identity has been rhizomatically articulated and enhanced, over the time, into projects serving new functionalities, visualizations and identities. This is most evident in the online section where the staircase has been explored transversely and reconfigured in accord with the artists’ main interests. It was turned into a salsa music machine and into a virtual dance floor (strewn with hidden and downloadable PDF documents) in Sol Calero’s project; into a painted guide to Italian restaurants in “Veronelli con noi”, through which, Daniele Milvio simulated a descent from North to South Italy and translated it into a gastronomic stop overs route. Another musical “encroachment” was made by Riccardo Benassi who produced, referring to the impact of technology on our domestic environment, “Every Casa is Techno Casa”, a free downloadable site-specific ringtone. 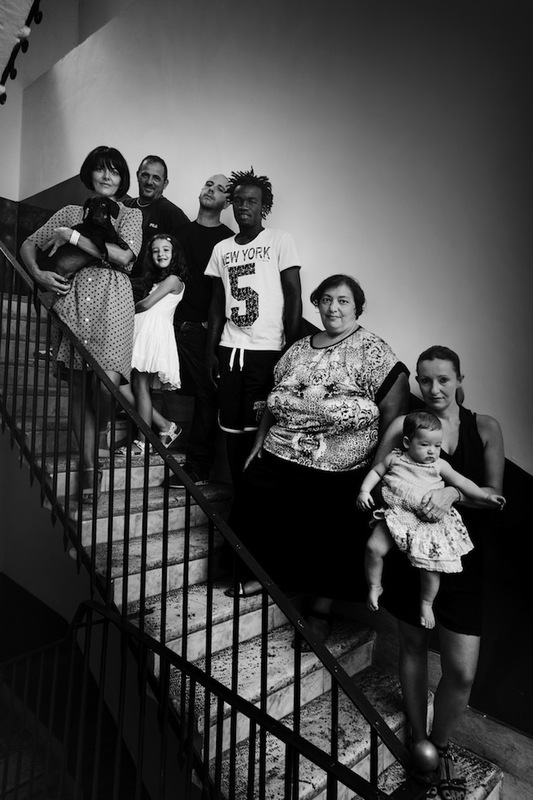 Nina Cristante saw the staircase as a congenial stage to perform her homemade “Fitness Povero” excercises while, Massimo Grimaldi reflected about immigration and foreign identities. 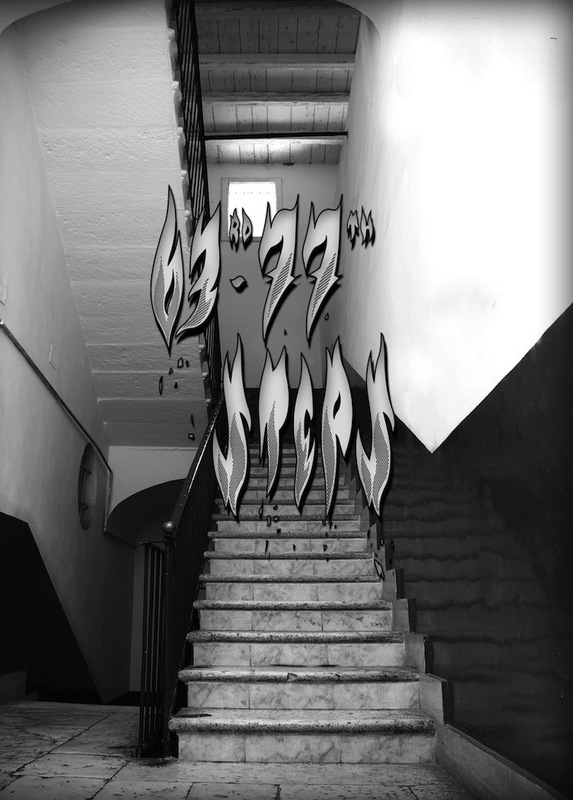 The latest project launched was “Mechanics Alley” by Ilya Smirnov, a succulent, dark, obessive electronic book incorporating texts, drawings and photographs into one in-depht location study. AO Few of the artists you show seem local. How do the exhibitions interact with the local space/culture? FS The programme has featured local, national and international artists, with a specific attention to those more recent post pop and post conceptual practices. Most of them had never exhibited here before, and this is undoubtedly an advantage for the local community, and also for the same artists that could reach an audience of an artistic decentralized area. The main challenge with the local context has been the debate concerning the digital, cognitive and fruition experience sustained by 63rd-77th STEPS. But the projects’ accessibility and dynamism facilitated the discussion. AO Does criticality/criticism necessarily come from a place of privilege? FS I do not think that criticality relegated to a privileged status any longer. Rather, it is its goal to identify and take a critical stance on conditions of privilege. Inevitably art undergoes this scrutinization. Nowadays the expression of critical thinking has accelerated and spread exponentially due to the proliferation of online forums, social networks, instant feedback etc. We all feel like critics in a way, and we are dominated and congested by an over production of opinions and analysis that, paradoxically, stimulate a more paralyzing awareness (as opposed to more emancipatory). This is a symptom and a result of profound cultural exhaustion, a response to the distrust of great narratives and the normative cynicism. AO What are your favourite famous staircases? FS The stairs of Kukulcan Temple in Chichen Itza Mayan ruins. AO Do you cry alone on the staircase? AO What’s the most memorable that has happened to u on a staircase? FS The most memorable thing that happened to me (aside from falling down the staircase once) occurred in concomitance with the exhibitions held on the staircase. Every project, actually, produced paradoxical and fun situations. My neighbour’s had no clue about contemporary art and were always very dazed with the works. Among others, I remember the evening before the opening of “Landing talk” by Amalia Ulman, the lady who lived on the ground floor, went up to the terrace to hang up the clothes and started to scream. She was confused, in the dark, by the butterflies with bats. AO Do you think a complicated exhibition space can overshadow the work, hence why people exhibit in the white cube? (People are so used it that they are able to focus on the work). FS Every kind of space plays a decisive role in the creation and in the output of an artistic work. I think it’s just a different way of approaching and contextualizing both the work and the space itself. A space with many connotations such as the staircase can be overwhelming, but I don’t think it’s more or less complicated than a white cube. The domestic nature of 63rd-77th STEPS has been addressed, enhanced or even avoided in very different ways by the works exhibited. AO How do you think the art institution is changing, and how do you think it should change? FS I don’t believe in the epic history of Art that is often proposed by Art history, and this is one of the questions that challenge my ability to reconcile both my romantic and nihilist vein. But I keep on being fascinated by the reactionary and imaginative power of Art, which I tend to consider independently of its business-oriented and megalomaniac approach. At the same time, I do not think it is easily defined- and I’m not a detractor of the market. I believe that the market is necessary as a circulatory system but it cannot substitute Art. It’s curious to see how art keeps on struggling with moral obligations and expectations. I find it difficult to address the issue by generalizing, and inevitably my vision is influenced by my Italian experience. But on a general level, Art institutions should be more vivifying, less self-referential, and take more into account the deep schizophrenia of our time rather than contribute to its suffocation.